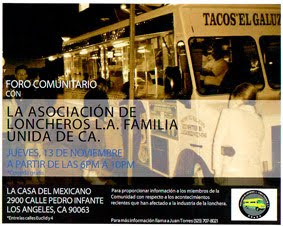 The history of the taco truck scene on the westside is a fickle one. Some trucks find a place to call home but many disappear after awhile . Take for example the history at Santa Monica Blvd and Westgate. Three trucks have come and gone from that location in as many years and the last truck at the location, Tortas a la plancha hasn't been seen in months. So what's wrong with the westside and why are so many trucks going elsewhere? It could be that taco trucks go where the night life is but if that was the case why aren't there any taco trucks in Santa Monica? Then again Santa Monica has never been a friend to the taco truck and probably has laws against them operating after a certain hour. So I headed to Mariscos Tatiana, a taco truck that parks some nights at Venice and Mountain View in Mar Vista. There is a nightclub across the street called Good Hurt that I don't frequent but have been to before. Judgeing from the name they specialize in mariscos(the truck not the nightclub...the club specializes in barmaids in tight uniforms) but I was curious how they turned out a taco so I ordered two asada and one al pastor. When my tacos were ready the first thing I noticed was that two of my tacos had salsa verde on them. I don't mind a salsa verde when it's the house salsa (like Garcia Bro's excellent salsa verde) but the salsa verde here was really bland while the roja was clearly the better salsa. It was a curious choice by the taco chefs to douse my tacos with their weaker salsa. I did mention to them that I am on a taco mission and only their finest slabs of meat will delight me(In my stewie from family guy impersonation)but they didn't take me seriously. 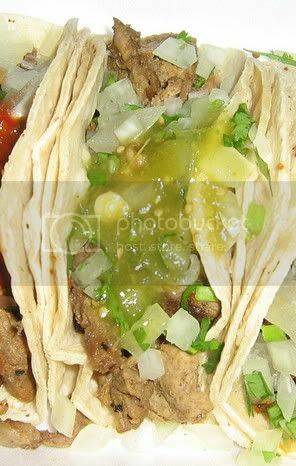 Or maybe they did take me seriously and covered my tacos with their weaker salsa to try to coverup meat that was less than fresh. Nice try Mariscos Tatiana! Not only did you serve me your weaker salsa but you also served cold meat that was already grilled and tossed on the grill again(I know this because I saw the cooked carne tossed on the grill). You did everything but kick me in the balls. But do you know why I am hard on your Mariscos Tatiana? I am hard on because you are capable of much more. The beef could have been much better if it were not twice grilled and served cold . The salsa roja was excellent and wasted by the lazy preperation of the meat. I'm eager to point out taco greatness when I witness it but I must also point out taco lazyness. I will revisit in a couple weeks but for now my taco rating reflects my satisfaction with these tacos. I used to work in Marina del Rey and was in love with the carnitas tostadas from the truck parked on Glencoe, just south of Washington. I'll bet the tacos are good too. I love your site, by the way. I moved to Japan 8 months ago and since then have had multiple dreams about finding taco stands hidden behind Japanese restaurants. Sadly, these dreams have never come true. So reading about your taco adventures is the closest I'll get to Mexican food until I move back to L.A.
Oh dang...a ONE taco mark. How is that possible??? Must of been really bad Badini! Yeah I feel bad for my negative review but the beef was old and cold. If I'm going to be taken seriously as a taco reporter I have to report the bad with the good. 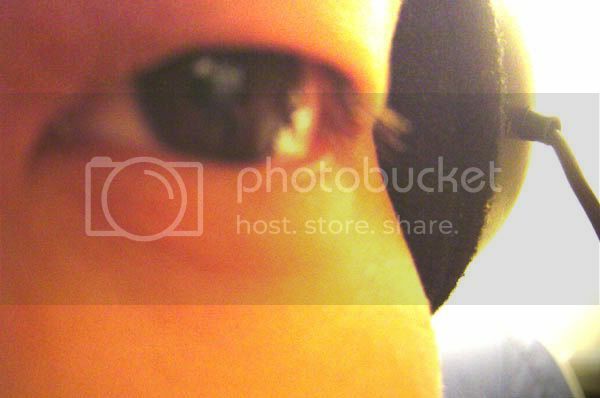 just want to say i really like your blog. i've been to the good hurt lots of times, and once i ate at the taco truck across the street. i don't think it was mariscos tatiana at the time, and unfortunately i was too drunk to notice if the tacos were good or not, i just scarfed them. 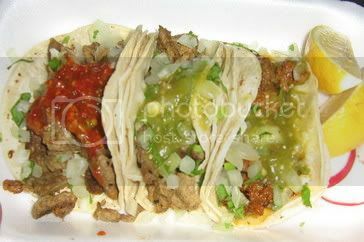 i live in simi valley... you should come review some tacos joints here! we have a carnitas michoacan that is awesome, also el taco de mexico, la palapa, and local favorites campos and tico's mexican food. keep up the awesome reporting! 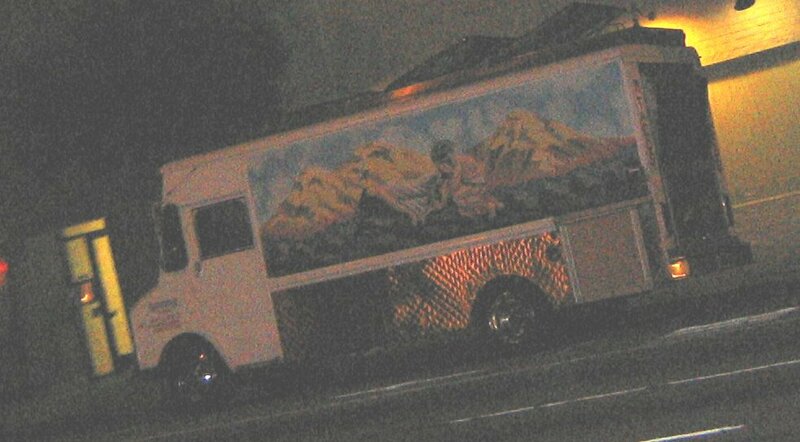 there's a truck in Santa Monica, just north of the Cloverfield exit on the right side, south of Olympic. I've never eaten there, but I see it most often before 7am. I was driving around aimlessly tonight thanks to this site in what I thought would be a futile search for tacos at midnight mid-week, but I was surprised to find this place. Not having all the reviews handy, I just bought 4 tacos (al pastor, asada, cabeza, langua). When I got back and saw that the truck only got 1 taco, I was kind of hesitant to eat the tacos that I had seemingly come across as if by fate. Tentatively, I bit into the first one (asada), and the meat (although I think it was grilled twice as well) was nice and toasty warm, and I'll agree that the red sauce is way better than the green, but overall, I can't complain. Then again, I'm no taco aficionado, so perhaps my opinion doesn't matter as much, but I liked it at least. Awesome site, keep up the great work. Yes, thanks for writing about this awful truck. They never get my order right and the tacos are only sub par. I'm trying to think of the truck up the block on Inglewood and Venice blvd. Their tacos are worth a shot but I think they're only around past 9. No more of this taco truck for us, its in front of Jules Stein Eye Institute at UCLA, and my supervisor found a horsefly on her taco. Yuck!